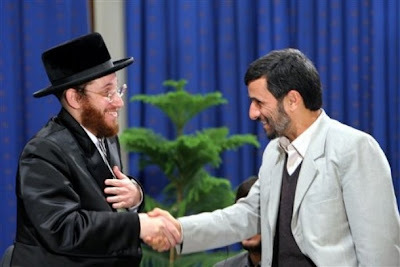 Ultra-conservative Rabbi Moishe Arye Friedman, left, shakes hands with Iranian President Mahmoud Ahmadinejad, during international conference questioning the existence of the holocaust in Tehran, Dec. 12, 2006. Photo by AP. In his April 20th speech to the conference on racism sponsored by the U.N. High Commission on Human Rights, Iranian President Mahmoud Ahmadinejad raised many valid criticisms of Western imperialism and the war in Iraq. But what he said about the founding of Israel compacted history in some very strange ways, echoing his earlier flirtation with those who deny the Nazi holocaust. As a secular Jew who rejected Zionism over 40 years ago, I found his remarks silly, misleading, and offensive. As an activist who has consistently struggled against both racism and imperialism, I found it self-defeating for anyone to take Ahmadinejad as our spokesman. Using the word “pretext” to describe Jewish suffering during World War II recalled the views of Holocaust deniers like Robert Faurison, Ahmed Rami, and Frederick Töben who went to Tehran in Decemeber 2006 for Ahmadinejad’s “International Conference to Review the Global Vision of the Holocaust.” Iranian officials insisted that the conference sought “neither to deny nor prove the Holocaust … [but] to provide an appropriate scientific atmosphere for scholars to offer their opinions in freedom about a historical issue.” But that’s the same disingenuous dodge that Holocaust deniers have used ever since they started their rehabilitation of the Third Reich. Simply stated, there is absolutely no doubt that the Nazis tried their hardest to systematically exterminate Jews -- as well as gays and Gypsies. To deny this is nothing short of immoral and idiotic. It also undercuts our ability to fight against racism and for a Palestinian state. Get “pretext” and Holocaust denial out of the way and there’s no question that Zionists used the reality of Jewish suffering to win support for the State of Israel, just as we now use the reality of Palestinian suffering to build support for a Palestinian state. Ahmadinejad’s compacted history similarly denies the historic reality of political Zionism. The powerful countries on the U.N. Security Council did not create the Zionist movement. European Jews, mostly non-religious, did, and they had to fight the Great Powers to do it. Where in Ahmadinejad’s simplistic anti-imperialist narrative is the very real nationalist movement that had to smuggle weapons and Jewish refugees into Palestine against the best efforts of the British Navy? Where are the attacks by Jewish “terrorists” against British troops? And where are all those Jewish communities that have lived continuously in Palestine for over 2500 years? None of this, in my view, ever justified dispossessing the Palestinians, a large number of whom were themselves undoubtedly descendants of the ancient Israelites. But to deny the Jewish story in Palestine, as Ahmadinejad does, is silly. Worse, it lays the groundwork to deny the humanity of the Israelis for whom all this history remains very real. Where Ahmadenijad is undoubtedly right is his contention that the unfairly constituted U.N. Security Council confirmed the creation of the Jewish state. But where does that leave those of us who are anti-imperialist? If we follow Ahmadinejad’s logic, as many in Hamas now do, we must fight to undo over 60 years of history, and that will be a fight to the death. The call to eliminate the State of Israel, while not explicitly a call to kill Israelis or other Jews, will sound to them as an incitement to genocide, and they will fight it without mercy. Tens of thousands of people, both Israeli and Palestinian, will die. And, in the end, who will win? I would not bet on the Palestinians. It’s certainly not fair, but the best I would hope for is a two-state solution, and that will be a difficult enough. One final question: Should we join Ahmadinejad in calling the Israelis “racist perpetrators of genocide?” I would not. The long-standing Israeli policy of seeking “more land and fewer Arabs” is horrendous. But it is not genocide, at least not until Avigdor Lieberman has his way. And it is not essentially racial, but increasingly religious, denying people first-class citizenship because they do not share the dominant faith or identity. To me, that is every bit as pernicious as racism, whether in Israel or any number of Islamic countries.